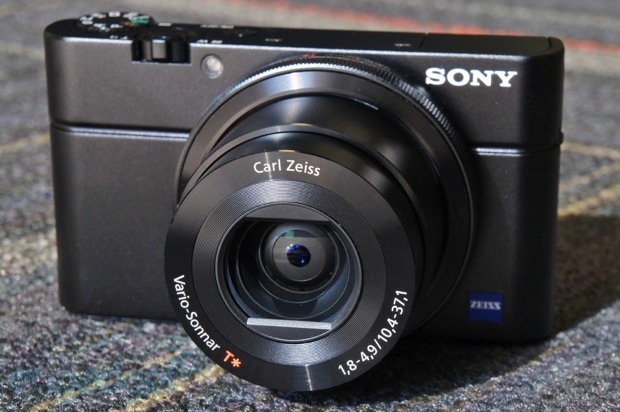 The Wirecutter's best deals: Sony's RX100 point-and-shoot and more! Engadget Giveaway: win a Sony Cybershot DSC-RX100, courtesy of IceMonkey! Not too long ago, full-frame digital cameras were cumbersome, heavy and very expensive. They're still a long ways from making a home in the bargain bin, but Sony's new RX1 definitely has size in check. In order to reduce the model's footprint, the Japanese camera maker added a fixed 35mm lens to this point-and-shoot-esque digicam, modeled after the company's gorgeous and versatile RX100. Both of these flagship Cyber-shots offer tremendous bang for your buck, but they'll thin out your wallet faster than they'll capture 10 consecutive 20-plus-megapixel frames. Still, as you'll read after the break, our resident camera reviewer Zach Honig is very much in love. It's a tale of two cameras, and the RX100 is very much the consistent, quick-thinking, svelte, ever-impressive know-it-all. It's a 20.2-megapixel point-and-shoot with a one-inch sensor and a $650 price tag, so you'd expect it to be fantastic. The experience, however, far exceeded even my most optimistic dreams. This is, hands down, the best compact camera on the market today. There aren't enough positive adjectives to sufficiently describe Sony's masterpiece, but take me on my word: it's absolutely fantastic. There aren't enough positive adjectives to sufficiently describe Sony's masterpiece, but take me on my word: it's absolutely fantastic. It's really hard to find things not to like about this camera. The focusing system is mind-blowingly fast and accurate, the exposure is always spot-on, color balance is consistently correct and the image quality is superb. The build quality is outstanding, the 3-inch LCD is sharp and bright, the dedicated mode dial is convenient and the f/1.8-4.9 Carl Zeiss lens is quite versatile -- it captures sharp snaps at night, or close-ups with creamy bokeh during the day. This dream of a camera came along on my two-month tour of Asia toward the end of last year. It captured brilliant shots of temples in Kyoto, beaches in Bali, ruins in Cambodia, shops in Singapore and elephants in Thailand. It snapped crisp, albeit slightly noisy shots at night, and bright, vibrant frames under the intense, unyielding sun. The camera photographed more high-calorie meals than I care to remember without gaining an ounce. And, at the end of each day, I topped up the high-capacity battery through a simple USB connection. Every week, I get an email from readers, friends and even colleagues asking which camera they should purchase. I don't even bother asking their budget -- nobody expects to spend more than 400 bucks on a point-and-shoot, and $650 is laughable. But I insist, regardless of how much money they've set aside, that they're gonna want to add a few more bills to the pile and pick up the RX100. I still use an NEX-5R for snapping hands-on videos, thanks to its powerful shotgun mic, but for nearly everything else, the RX100 is my go-to camera, and it should be yours, too. 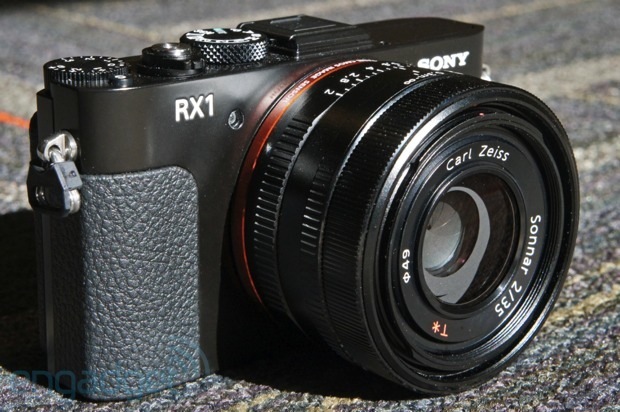 Now, if you thought $650 was a ridiculous sum for a compact camera, you're really going to get a kick out of the RX1. It'll cost you -- wait for it -- two thousand, eight hundred dollars. That's right, $2,800 -- there's a comma in that price tag. Why in the world would any such machine run you nearly three large? The full-frame sensor's to blame. Accommodating a 35mm sensor, the same chip that ships in Sony's a99 DSLR, in such a small housing meant going with a fixed 35mm lens. There's a maximum f/2 aperture, which, when paired up with the giant sensor, results in some incredibly shallow depth of field. Whereas I'd recommend the RX100 to photojournalists, preteens and everyone in between, the RX1 simply isn't going to cut it for the vast majority of digital shooters. So, if you have boatloads of cash to burn and you have your heart set on the best of the best, that's not reason enough to spring for Sony's impressive engineering feat. If, however, you know exactly what you're after, this 24.7-megapixel stunner should keep your SD card, and your heart, full and warm. If you've ever shot with a prime lens, you know what to expect here. Since a weekend of shooting in NYC in winter isn't much fun, regardless of the camera around your neck, the RX1 and I hitched a ride to Hawaii for a long weekend of sand, sushi and sunsets. The RX100 spent most of that time in the hands of my girlfriend, who, I must add, is also head over heels in love with that thing. Yet, despite the superior specifications of my own solid shooter, I was often quite jealous of the shots she was able to achieve, thanks in no small part to the RX100's optical zoom. Framing with a fixed lens is incredibly challenging, and while I was up to the task, as a casual photographer, I can't say it enriched my experience enough to warrant unloading an extra two grand of hard-earned cash. Close-up shots required switching the lens to macro mode and getting incredibly close to my subject, rather than flipping the zoom toggle and maintaining a safe distance. A new perspective at sunset meant walking hundreds of feet, often into the water, in order to avoid snagging lampposts and other unsightly elements. If you've ever shot with a prime lens, you know what to expect here. On the other hand, the dedicated aperture ring and exposure compensation dial were incredibly useful, and, with the proper accessories, I could make very good use of the full-size hot shoe on top. Similarly, the full-frame sensor enabled low-light captures that would have yielded a fair amount of noise if shot on the RX100, and much of the time, I did appreciate having such a shallow depth of field at my disposal. Still, my RX100 experience set the bar very, very high for the RX1, and as much as I may not want to admit it, I'm enthusiastically shipping this short-term loaner back off to Sony, feeling a tad bit defeated by the almighty full-frame compact.